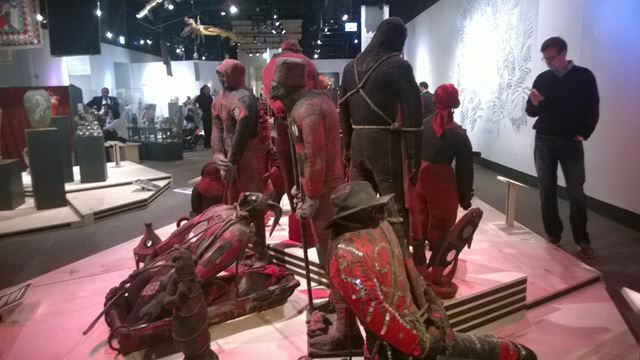 At the end of my last post on the Vodou Exhibition at Chicago’s Field Museum, (you might want to click the link and give it a read if you want to come up to speed,) I mentioned that I’d visit the exhibition again and see if my thoughts changed. Friday night was an event in which Chicago’s Haitian community welcomed the new exhibit with delicious verve (See Figure 1 below). It was a great opportunity to speak with artists and others about the exhibit, to get their opinions. Many of theirs were similar to mine. However, I did do something different this time. I spent more time looking up at the banners, and I spent more time on the artifacts that didn’t appear to be from secret societies. (I didn’t just look, I studied, read, worked at really trying to understand.) In the end, this lightened the experience considerably, but did it dispel the overall dark vibe of the exhibit? My suggestions for event would be the following. Change the banners that are used for publicity. They contain Secret Society Lwa. Do something lighter. Tell a story with the exhibition. Start with the misconceptions you want to dispel, the points you want to get across. Then start dispelling and telling the story of Haiti and Vodou. Explain the day to day in Haiti and where Vodou fits. Show how it interacts with other religions – perhaps even how families often practice Catholicism and Vodou simultaneously. Build an elevated area that is behind a red curtain (or make the curtain look like a forest covered mountainside. ) Entitle that section: “Inside Vodou’s Secret Societies”. Maybe put a small disclaimer at the beginning saying small children might be disturbed by what’s inside. Put those Secret Society artifacts (an example of which is in Figure 2 below), behind the curtain and out of the main stream of the exhibit. Make sure it’s not somewhere in the middle of the exhibit. The Secret Societies are not mainstream and mixing these artifacts in with the everyday artifacts mischaracterizes what many people experience in everday Vodou. However, Secret Societies need to be referenced in the everyday exhibits- after all, they did indeed impact Haitian life. I also believe that ‘hiding’ the Secret Society artifacts will do another thing: people will slow down. When people are in fearful situations, they tend to move more quickly. If you want people to move slowly and observe – hide the dark stuff. Children are noticeably absent from many of the videos and explanations. Of the Haitians I spoke with, all of them had non-intimidating memories of Vodou as a child. They remember the brightness, the music, the activity on Holidays. If a child can feel it, adults will too. Move explanations closer to artifacts and make them readable without having to bend neck or body. Bring banners closer to eye level. Create exhibits that allow the most visitors to stand straight and tall. Haitians wanted this (and still do!) and Vodou helped them. Include more ways for people to interact and touch. 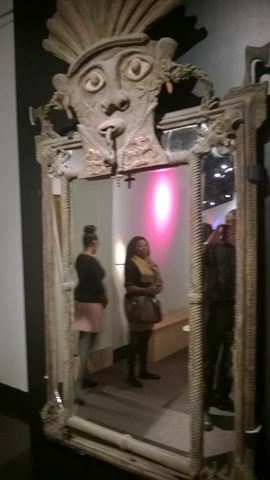 Granted, the artifacts at the exhibition are were used in Vodou and as such, are not open to touching. But, there are other ways to help people to hear, taste, feel, smell, touch. Drumming is key to Vodou. Let people make virtual drums (or real ones!) Get innovative! End the exhibition showing how Haiti is growing (albeit slowly and painfully at times) and what challenges lie ahead. Reiterate how Vodou has been a misunderstood part of the process, that Vodou comes from the heart of the Haitian culture and it’s been responsible for establishing a spirit of (and physical!) freedom in a nation. Show bright artwork that comes from Haitian artists, even those works from those mounted by spirits. With the above changes, I believe the exhibit would better accomplish its goal of dispelling misconceptions of Vodou. I’d love to hear your thoughts and what you’d do! I had an opportunity to go to a Member’s Only night at Chicago’s Field Museum. The event was in honor of the opening of a new exhibition entitled: Vodou – Sacred Powers of Haiti. Figure 1 From Left to Right: Dr. Serge Pierre Louis, Kira Tippenhauer, and Janet Hong. 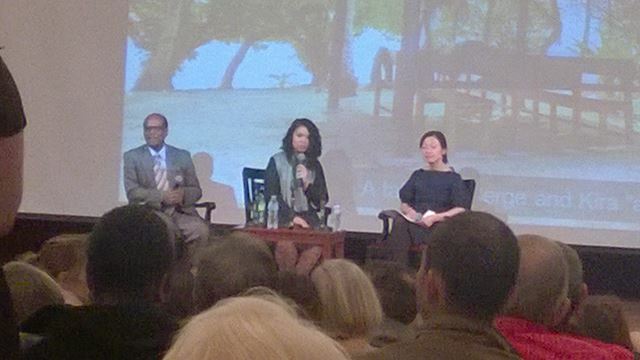 To start the discussion, Ms. Hong asked for Dr. Serge’s and Kira’s impressions of the exhibit. Their answers were not, judging from the reaction of Ms. Hong, what she expected. Kira’s first word was “dark”, and she spoke the word with a hint of disappointment in her voice. Clearly she did not want to say those words. She struggled for more words… Dr. Serge chimed in and agreed, and used the word “ferocious”, to which Kira agreed it was the word she’d been searching for. So, where did the exhibition go wrong? How does something that’s supposed to dispel perceptions of darkness, perpetuate it? How does darkness permeate when Haitians live in perpetual summer, lush greenery, flowers and nature, and live life filled with joyous dance, song, and savory foods? It’s not like the exhibit was designed in an asympathetic manner. 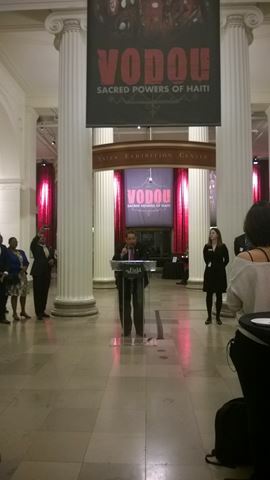 The exhibit was co-designed by Rachel Beauvoir-Dominique, who is a PhD anthropologist and practicing Vodou priestess. Yet, design and curation did not harmoniously weave an experience that dispelled misrepresentations of Vodou, and instead, darkness prevailed over experiential light. While not necessary per se, there is scant multimedia and no interactive technology at all. Again, Vodou seems to be very tactile and sensory based. Not having ways to interact in some way was a negative. The layout was not easy to take in. There is a wall explaining the history of Haiti’s struggles and victories and it runs into a wall at the end. When you finish reading you are right next to the entrance to the exhibit. (This is visible in Figure 4. below. The ending is behind the lwa in the corner by the drapes.) You literally have to start the exhibit over again, and you’re put into the flow of those entering. Then there’s the upper and lower displays. Even though everything is on one floor, it is actually split into two halves, either by accident or by design. Sculptural works are on ground level, and beautifully decorated, brightly colored ceremonial banners, as well as many artifacts, are hung high above. As a result, artifact descriptions are not correlated directly to their artifacts in an intuitive manner, hence there’s confusion about what description belongs with what. The descriptions are also written with uncomfortably small letters. It forces people to bow their heads and/or hunch their shoulders and/or bend ever so slightly to read. This posture is uncomfortable and is also one of vulnerability, and people don’t like to be vulnerable in front of something that they don’t know, especially if it looks scary!